In the second part of the series about Circular economy, we explore the possibility and benefits of applying this concept in Egypt. Economic Analyst and Assistant professor at the Faculty of Economics and Political Science Alaa Abdel-Rahman helps us imagine how the Circular Economy concept can be applied in Egypt, and what could be its benefits. 1- Can such futuristic economic concept be applied in Egypt? Theoretically, anything can be applied in Egypt. However, realistically, the dynamics that will govern such as a concept will be quite different than on paper. 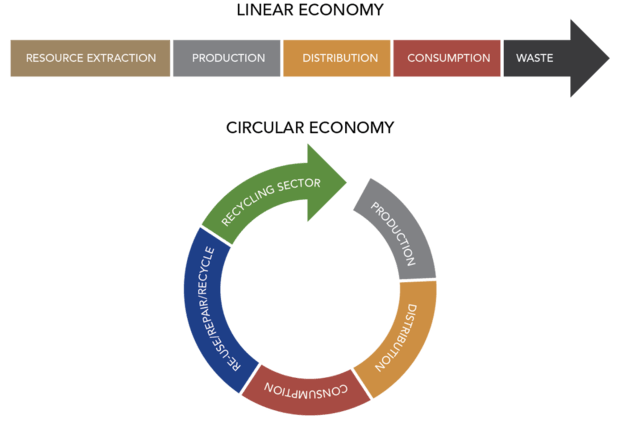 In sum, circular economy depends on a life cycle for the product that is different than what we are used to. Instead of a “make-take-dispose” cycle where the product is made, bought than after a certain life span of ‘x’ years is disposed for good-a sort of linear kind of life cycle- the concept of circular economy replaces the “dispose” aspect with “repair, refurbish, recycle” thus, giving a circular criteria to the life cycle of the product. On the consumer level: I think Egyptian consumers have the disposition to apply and accept such a concept especially given the economic conditions they’re going through. With the flotation of the Pound already in place, the purchasing power of the average Egyptian has significantly taken a hit. So when the consumer finds out that for example, their phone or laptop can be repaired or refurbished or even recycled for a cost that is less than buying a new one, granted that they get their items back in a pristine condition, I guess they would be definitely on board, however, spreading the cultural acceptance of using recycled products is important. But let me go back to how the dynamics in reality won’t be as smooth in Egypt’s case as they should be on paper. Circular economy takes all industries and sectors into account but in Egypt, a few select industries will be the core of the circular economy concept. For example, the electronics industry will definitely be one that Egyptians will gladly apply the concept to, given the high cost of purchasing a new product., I see the concept being applied in Egypt given the current economic conditions but only in certain industries where the average Egyptian’s purchasing power will have taken a hit. 2- How do you see it being applied? For producers and manufacturers, it’s still not that widespread. I think given the right regulations and business environment, major manufacturers and producers will be on board. It’s important that for such a concept to be applied, that manufacturers and producers align themselves with their respective supply chains in order to make available the options for recycling, repairing and refurbishing for their specific brands therefore, giving their customers the option to use and re-use their specific brands of products. 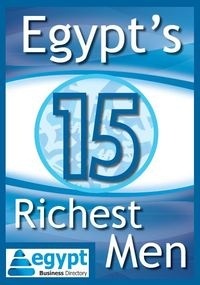 3- What are the benefits specific to the Egyptian economy/ business? For Egyptian businesses, cost minimization will be a major change for them. First of all, I believe that the cost of recycling or re-using components from their previously made products will be less than producing these components or buying them from their respective supply chains. Therefore, their revenue streams will be maximized at best. Second, their energy efficiency will be maximized as well. Given that their direction of production would change from exclusively making products from scratch to re-using old components to fabricate new ones, their reliance on heavy energy sources should diminish thus, encouraging them to use renewable energy which would be cleaner and less costly. For the Egyptian economy as a whole, harmful waste from previously disposed products should see a definite decrease as well as improvement in the production process reliant on more renewable energy sources therefore, improvement in air quality and reducing pollution. With revenues maximized from production, this would see an increase in investments inflows in that particular area of recycling and refurbishing, giving way to new business opportunities. Informal supply chains would be incentivized to become more formal by striking deals with the producers and manufacturers to take over the repair, recycling and refurbishing their particular brands, therefore streamlining the process and adding more value added into the economy. 4- What kind of support/change is needed from the government/laws to apply it? I believe the government has already taken the first step with all the laws and regulations the administration is trying to pass regarding renewable energy sources with Feed-in-Tariffs being put on the table and investments in the billions in these sources. I think the government should do more in giving access to producers and manufacturers to waste areas so that they could be able to streamline their recycling and refurbishing processes. The government should also continue to push for formalizing informal businesses especially supply chains and encourage citizens to recycle and refurbish with measures such as VAT cut backs or refunds on purchased recycled/refurbished products. Sanctioning industries using non-renewable, hurtful energy sources and decreasing costs for renewable energy sources should also be on the agenda if companies are to be encouraged in putting in place the circular economy concept.